A week after being released, there’s a new Aussie album at the top of the classical music charts. So, what about it, you may ask. 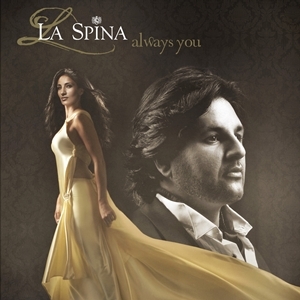 “Always You” is the first album by La Spina: Rosario La Spina and younger sister, Anna-Maria. What’s interesting, is that Rosario is an accomplished operatic tenor and Anna-Maria, a pop diva. They’ve combined their styles and creative energies into this highly original album, complete with 65-piece Melbourne Symphony Orchestra…. Bizarre to purists perhaps, but quite beautiful and more accessible to those who aren’t so staunch in their classical music consumption. But then, I own an expensive Shih Tzu-Poodle cross and a generic black cat: cross-over suits me fine. Nine of the thirteen tracks are original. Anna-Maria has started to come into her own with writing music, as well as performing it. She showed talent early on: while the rest of us at Mt Alvernia College in Brisbane, squeaked out our Hail Marys and volunteered each other to the ex-nuns for the next liturgical dance opportunity, Anna-Maria was belting out songs with a strength and maturity that was simply astounding. She was even on tv and won “Star Search” aged 17. Big back then, much bigger now. Anna-Maria toured with Savage Garden and worked alongside many internationally acclaimed artists. If her brother, Rosario, is called “the Australian Pavarotti”, then Anna-Maria is probably a more soulful “Australian Celine Dion” or maybe Streisand, or maybe Cher. It’s a big voice and it doesn’t readily compare to most pop princesses. The album itself mostly comprises stadium-sized sounds: you could open the next FIFA World Cup or Olympics with a bang this big. It’s not tea and scones music. I love “The Prayer” – stunningly beautiful, is all I can say. “Heavenly” is motivational … “in every cloud your rainbow waits”. The ex-nuns would be proud. “Time to Say Goodbye” – will make your hair stand up on your arms. “Vivere” – gosh, if they put this at the end of a Stuart Little or Lion King type kids’ movie, there wouldn’t be an adult in the cinema with dry eyes. “Always You” is lovely in Italian and English. “I Wish I’d Never Known” could’ve been written for a Roman Polanski film. “Everyday” is easy to listen to and harks back to its pop origins. This could be remixed as commercial pop. La Spina’s take on Iron Maiden’s “Run to the Hills” would be fabulous to crank up on full volume to encourage door-knockers to move on, quickly. Miss 6 is showing an unhealthy interest in becoming an industrial chemist. This is the second time she’s mixed my bathroom products, more precisely, my (won’t admit how much it cost me) clear eye gel, which looks great now with sparkly blue toothpaste in it. I’m posting this video today because it’s a safe way to express the challenges of being a mother, rather than ranting about how much I loved that eye gel … I shall go cry in my cappuccino now. Enjoy the show. You need about 5 minutes. Reader JB is soon to travel overseas with three children and wonders how to keep them entertained for the long haul flights, without the added worry of extra baggage and lost game cartridges. Exhibit A is an iPod Touch, in a flip-case, attached to a comfy fluffy laynard and with a zippered purse attached containing earphones. No game cartridges, just downloaded applications. No lost earphones. No misplaced iPod. Music, games and educational apps all in one place. How’s that? 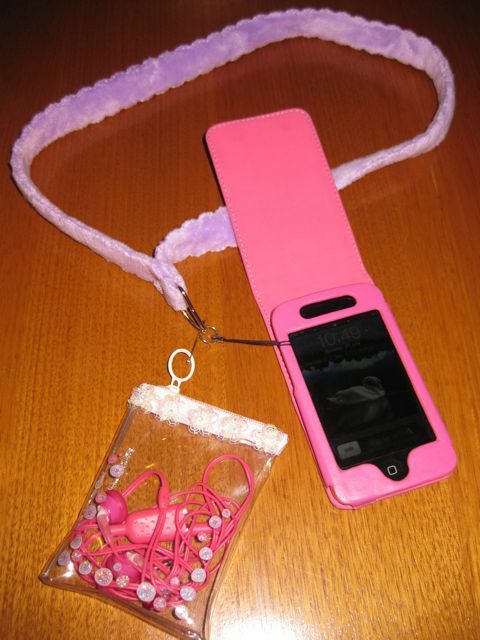 The laynard and case came from a mobile phone accessory store, and the purse I already had from a kids’ lip balm set (but zippered coin purses can be bought just about anywhere). Enjoy your trip, JB! Hope this helps. I forgot to mention, that the way to get two people using one iPod Touch, is to buy earphones with the capacity to plug in a friend’s earphones (such as the ones in the photo, bought from Target). Alternatively, you can buy an adaptor such as the one from Smiggle (“Heart Hub“) which allows two single user earphones to be connected. While I’m at it, check out the new app, “Baby Animals”. It’s great for kids of all ages (adapt its use accordingly). It has pictures of every animal you can think of and quizzes and information about them all. Great for long trips and school projects … and long waits in doctors’ surgeries …. I so loved this song back in the day, that I mixed just about every family video to it, including Granny’s post-stroke recovery trip to New Zealand (it livened it up a bit).